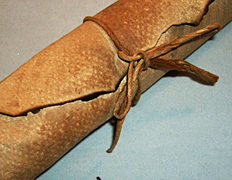 Print a mothers day poem onto aged parchment paper and turn it into a mothers day gift. This is one handmade mothers day gift that any mother will love to receive from her child. No doubt that this is a very cheap mothers day gift but any mother will be so enchanted by this unique handmade gift and will surely treasure it forever. mothers day project without the supervision of grow-ups. the lighted candle to burn the paper. Here are the art supplies and step-by-step instructions to make this aged parchment mothers day gift. click here to view a bigger image of this printed poem. 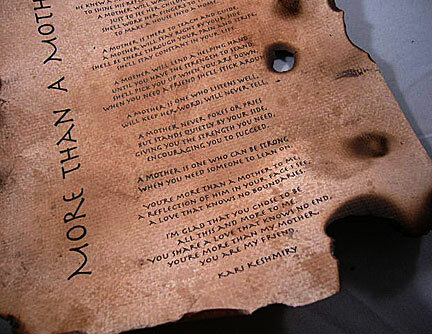 For this mothers day project, I chose the following mother's day poem 'More Than A Mother' by Kari Keshmiry. You can copy this mothers day poem and paste it into Photoshop or Microsoft Word, resize it and change to any fancy font you like. Or if you like, you can also download this 'More Than A Mother' poem by clicking here. This will open up a pdf file. Just print it out onto your faux aged A4 size cardstock. Just follow the instructions below to make this aged parchment mothers day gift. click here to view a bigger image of this aged mothers day poem gift. Pour your walnut ink or unsweetened black coffee into the spray bottle. Spray randomly over the A4 sized cardstock. Turn over and repeat the above. When you find that you like the look, use an hot iron to flatten the cardstock. Put it into the printer and print the mother's day poem. Hold the cardstock on your left hand and a piece of wet cloth on your right hand. Burn around the edges of the cardstock. Be careful to stop the burning with the wet cloth. It's better to burn a little at a time stopping the fire from getting big with the wet cloth. For the burnt patches on the the cardstock - find spaces between the printed words of the mothers day poem. Put the cardstock over the lighted candle and let it burn. Be careful not to let it over burn onto the printed words. Turn the cardstock over and let the lighted candle leave soots on the mothers day poem. Tear the edges which are not burnt and dab with the coffee or walnut ink to age it. Dab some of the ink on the string and let it dry. Roll the mothers day poem and tie with the aged string. That's it! A cheap mothers day poem gift - cheap but definitely priceless! Tie an old metal charm to the end of the string. Melt some red wax and while still hot and pliable, press a rubber stamp or metal seal onto the wax. Stick the waxed seal onto the string or on part of the mothers day poem. Decorate an empty potato chips container with nice aged paper to store the mothers day gift.